Do you know what we call a whole lot of green beans? We call it a "mess of beans" around here, as in "I just picked a mess of green beans, nearly five pounds worth". 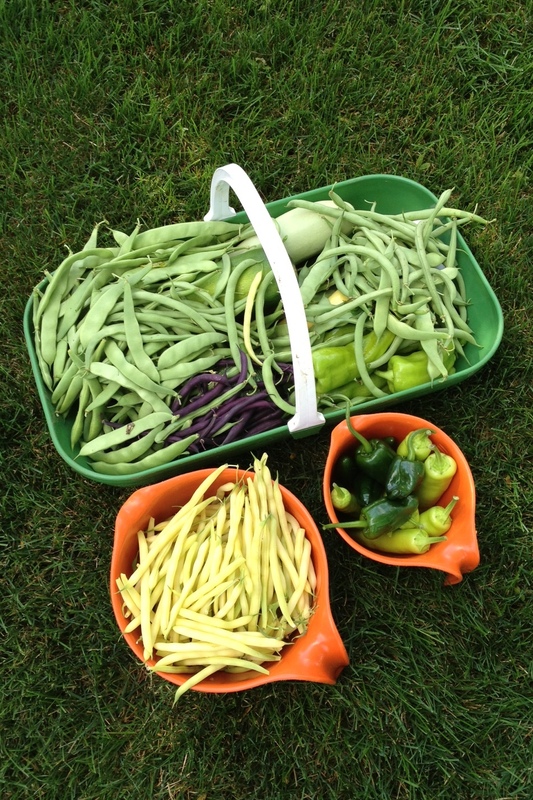 I also picked green beans last Sunday, and though I didn't weigh them, I would guess I picked maybe three pounds worth. These are the very best green beans I have ever grown in all the years - and there are many years - that I have had a vegetable garden. There is not a single bug spot on any of them. I didn't even see any bugs in the garden when I was picking the beans except for a few bees busy around some nearby squash. Bees, as we all know, are good bugs. I sure am blessed to have this mess of green beans. I think I have enough to give away and also to freeze for winter time eating. Oh, and I'll fix some to eat this week. 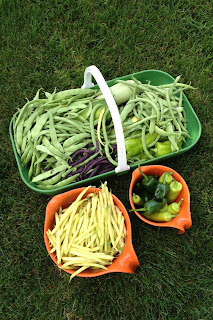 It's good to have a mess of fresh green beans in the summertime, along with zucchini squash and sweet peppers, which are under the mess of green beans in my harvest trug, and a bowl full of hot peppers. Now, if a tomato or two would please turn red and some of the sweet corn would please plump up a bit, and some of the eggplant would please get bigger, I'd have the fixin's for a very fine summer supper. I wish I lived closer so I could show up on your doorstep begging for must a small portion of a mess o' beans (perhaps a "messlette?). How many plants of each kind do you have? I never plant enough and have given up because I only harvest a handful at a time. In my very small garden I planted Kentucky Wonder Pole Beans, and I have been very pleased with them. I have been picking about one pound at a time. It is just right for the two of us, cooked with a sweet Vidalia onion and new potatoes (store-bought) - Throw in a chuck of ham for flavoring - delicious! My mother-in-law always called it a "mess of beans." the first time I heard her say that I thought she was being sarcastic. Not so! That was 40 years ago and she always fixed them with a piece of salt pork - bet nobody does that nowadays! Anyway that's a fine mess you've got. Good thing your "mess" set before the rains started in earnest. Veg growers here are getting very poor pollination because of the daily rains. The majority of our fresh tomatoes are still being shipped in...a crime for July! I love green beans, but at our current home,, I don't have the room to grow a lot of veggies. sigh! Love beans, do you ever pickle them? As for tomatoes, mine are a total disaster this year. I've pretty much given up on them and turning my attention to the beans, carrots and beets. It's a good green bean year here too. And no bugs either; the one I can't figure out is I've got no squash bugs on the zucchini either. Armageddon must be near. I just planted some for a new trellis--I hope mine are 1/10th as good as yours--that will be good enough!